Mohammed Morsi, the Muslim Brotherhood’s presidential candidate in Egypt, says he respects the court ruling allowing Ahmed Shafiq to run. Mohammed Morsi, the Muslim Brotherhood’s presidential candidate in Egypt, said on Thursday that he respects the Supreme Constitutional Court’s ruling against the Political Isolation Law. Earlier, the court ruled against the law, that would have barred deposed president Hosni Mubarak's last prime minister, Ahmed Shafiq, from participating in Sunday's presidential runoff against Morsi. The court also disqualified the country's parliament, ruling that one third of the seats in the Islamist-dominated parliament were invalid. 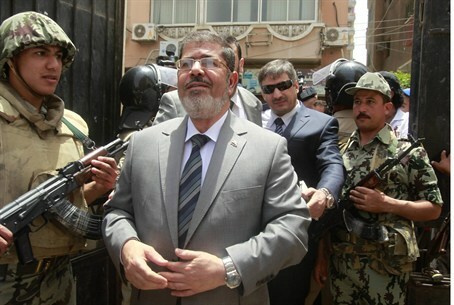 Morsi, who spoke in an on a local satellite channel and was quoted by the Al-Masry Al-Youm newspaper, said he is not completely satisfied with the ruling because he knows that the Egyptian people supported the Political Isolation Law, but added that he respects the verdict nonetheless. Asked to respond to fears regarding potential election rigging, Morsi said that he is worried that former regime figures could use money to influence the will of the people. “Our fear pushes us to work, and Egyptian people from all segments of society will go out to say yes to the revolution, and no those who want to violate its dream,” he said. Mori also slammed Justice Minister Adel Abdel Hamid’s decision to give military officers and personnel the right to arrest citizens, which was announced Wednesday. “It looks like the Emergency Law is coming back,” Morsi said, rejecting the idea that the decree constitutes a military coup, as others have suggested. Earlier this week, Shafiq and the Muslim Brotherhood sharpened their attacks on one another. Shafiq started the round by accusing the Brotherhood of paying thugs to attack his campaign headquarters in Cairo last month. The Brotherhood in returned accused Shafiq of telling “huge lies” and said he did nothing to stop a notorious charge on protesters in what has come to be known as the “Battle of the Camel” during the January 2011 uprising. The group said in a statement that Shafiq's lies aim to tarnish the Brotherhood's image and mislead voters so that they either do not vote for Morsi or boycott the runoff altogether. Thousands of people demonstrated in Egypt last Friday to demand that Shafiq be banned from the runoff. Shafiq, meanwhile, pledged he would uphold freedoms in a press conference.